Exactly three days before this session happened, Chicago reached record breaking feel like temps of close to negative 50 degrees, and now these two are dancing around downtown Naperville in 35 degrees! Was it Mother Nature? Or did Abby and Matthew turn. up. the. HEAT! ;) These two were AMAZING during their session! Every pose I would put them in, they had their own way of making it their own and showing who THEY truly are and I LOVED that! My favorite part of their engagement session though, is probably the fact that I felt like I was hanging out with old friends out on the town. 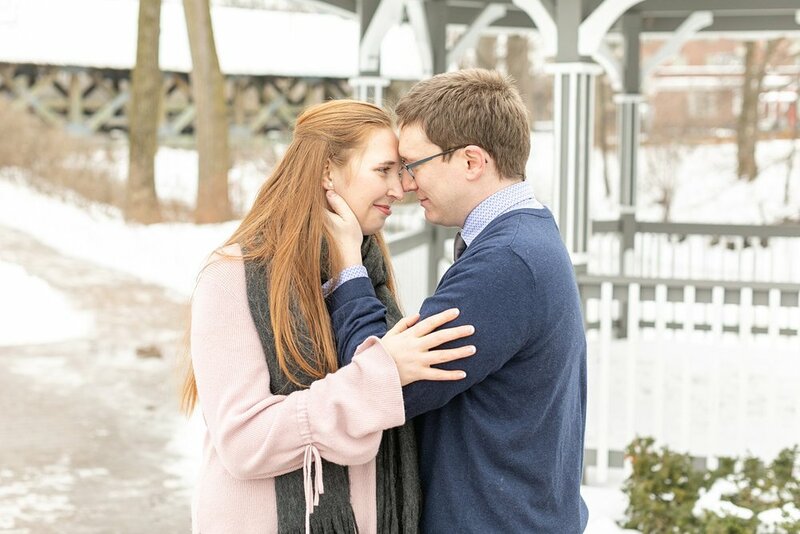 Abby and Matthew officially became a #MeganGogginsCouple back in September and by the time their session rolled around, I felt like I already knew them! Social media has its perks for allowing people to get to know one another even if they live almost 4 hours apart! These two seriously are the sweetest things! The way they would talk to each other, and interact with each other while I put them in certain poses, and then laugh about it, it just made me more and more excited for their wedding day! They just couldn’t be any more perfect for each other and I am HONORED to be able to capture that big day for them! JUNE, WHERE YOU AT?! They are planning a dusty blue summer wedding at an INCREDIBLE venue that I am so looking forward to! It’s going to be amazing! But, until then, here are just a handful of my all time favorite images of these two being engaged! I had so many favorites from this day and it was so hard to make this post not a mile long! Haha! Hope you enjoy! !